All the reviews I know about are listed below. If you know of any others that should be added, please contact me. The scope of Kaye’s analysis, his insightful and meticulous eye for detail, the coverage of both law and science (not forgetting the math), and the spicing with human tales of crimes and academic rivalries combine to ensure the book� will interest a medley of readers. …The work of Kaye goes some way to demonstrate that the barriers to communication can be breached. … [M]ay the book get the wide readership it deserves. Read the full review from Nov. 12, 2010. 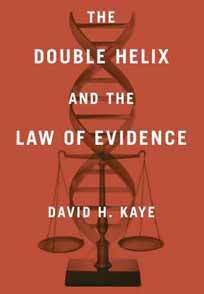 David Kaye’s The Double Helix and the Law of Evidence is a remarkable accomplishment. . . . It is a rich and nuanced story about the intersection of science and law. . . . Given the complexity of the subject, the book’s clarity is noteworthy. . . . Double Helix is a tour de force, a must-read for anyone interested in evidence law or forensic science. The reviewer, Paul C. Giannelli, is Distinguished University Professor and Albert J. Weatherhead III & Richard W. Weatherhead Professor of Law, Case Western Reserve University. The full review is in press for the Fall 2011 issue. Magisterial … a fascinating tale [from] our nation’s most prominent commentator on genetic evidence and on the use (and misuse) of statistics in the courtroom. Kaye has produced an extraordinarily well-written and important book. He has a unique ability to explain the nuances of scientific and statistical disputes in succinct, non-technical language. It will be essential reading for judges and legal scholars seeking a deep understanding of the scientific disputes, and the events inside and outside the courtroom, that constituted the “DNA Wars.” By shaping our understanding of this important event in our legal history, this volume will influence how legal scholars, judges, and lawyers approach the admissibility of scientific evidence in the future. The reviewer, William C. Thompson, is at the School of Law and the Department of Criminology, Law and Society, University of California, Irvine. Read the full review from Nov.-Dec. 2010. David H. Kaye is a law professor renowned for his meticulous attention to detail, careful argumentation and impressive technical mastery of statistical and scientific issues. … The Double Helix and the Law of Evidence offers a detailed, authoritative accounting of the legal cases of this period and of scientific debates that ran in parallel in the pages of scientific journals. The reviewer, Simon A. Cole is associate professor and chair of the department of criminology, law and society at the University of California, Irvine. Read the full review from May-June, 2011. Kaye draws from his substantial experience and his prior legal scholarship to create a concise and highly readable text devoted to the basics of DNA evidence and its historical development. … Kaye’s book struck an excellent balance between law, history, and science. The Double Helix and the Law of Evidence offers something for lawyers and non-lawyers alike (including judges and judicial clerks), and should be a particularly welcomed resource for an upper-level seminar class in law school. The reviewer, Matthew J. Dowd, is an attorney at Wiley Rein LLP. He represents clients in appeals before the U.S. Court of Appeals for the Federal Circuit and in district court litigation, including patent and general commercial litigation. Read the full review from March 2010. The power of DNA technology to identify murderers, rapists, and robbers and to confirm or refute claims of parentage or other kinship is beyond dispute,” notes Kaye, a law professor at Penn State. But as the infamous People v. Simpson case showed, the question of how to interpret such genetic evidence has been contentious. Kaye offers a weighty but readable assessment of the science and the courtroom battles. [A] fascinating account of the complex history of genetic evidence. Professor Kaye clearly explains the science and statistics behind genetics, and the compelling examples he pulls from both civil and criminal cases provide valuable context to his explanations. Read the full review.from 2010, vol. 102, no. 4, pp. 647-648. A legal scholar describes the history and future of DNA-based evidence in the American justice system.